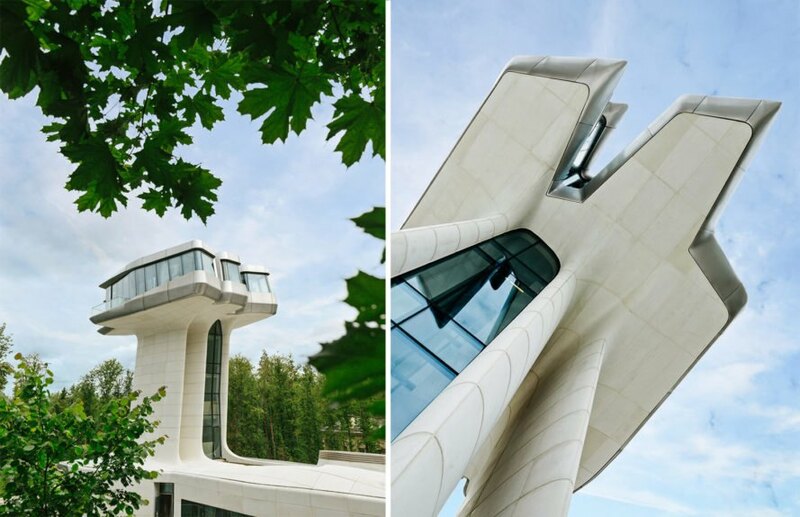 Zaha Hadid’s only private house has just been completed and — to no surprise — it looks like a spaceship that has touched down on Earth. Created with a neo-futuristic aesthetic and ample glazing, the Capital Hill Residence stands in stark contrast with its leafy surroundings. The home is located at the heart of Russia’s Barvikha forest, just a couple miles west of Moscow. The $140 million project was completed for real estate developer and entrepreneur Vladislav Doronin, who runs Capital Group and OKO Group. 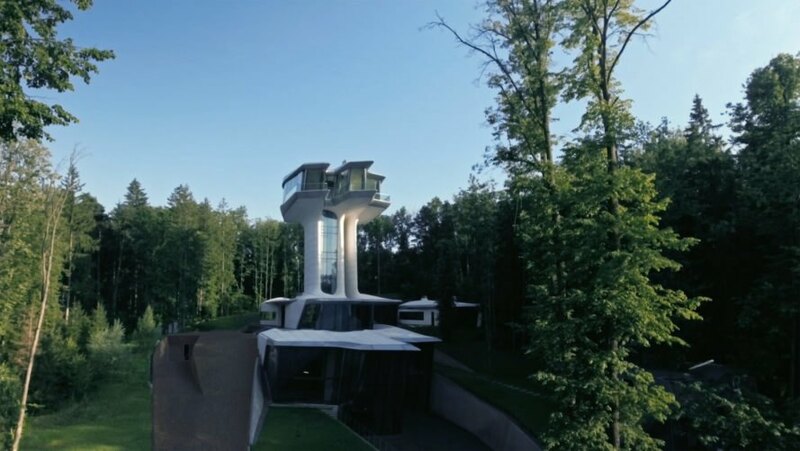 The 36,000-square-foot sci-fi-esque house immediately draws the eye with its stalk-like tower that rises 117 feet above the ground. Hadid placed the master bedroom at the top, so Doronin could wake up to panoramic views of the tree canopy. The master bedroom connects to the lower levels with a glazed elevator and staircase. 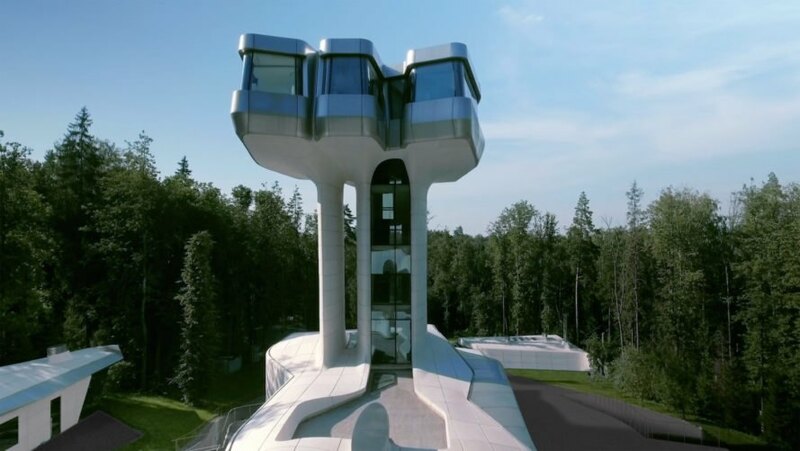 Zaha Hadid’s only private house has just been completed and — to no surprise — looks like a spaceship that has touched down on Earth. The Capital Hill Residence stands in stark contrast with its leafy surroundings. The majority of the home is built into a slope and includes a pool, spa, gym and even a nightclub. The home is at the heart of Russia’s Barvikha forest, just a couple miles west of Moscow. The house immediately draws the eye with its stalk-like tower that rises 117 feet above the ground. The master bedroom connects to the lower levels with a glazed elevator and staircase. The $140 million project was completed for real estate developer and entrepreneur Vladislav Doronin, who runs Capital Group and OKO Group. Doronin, who met Hadid a decade ago, is reportedly very pleased with his home. He was sold from the moment he saw Hadid’s initial sketches on a napkin.